1. Itsilver Innovation and Infotainment Llp reserves the exclusive right to change/alter/amend the fees applicable on the SRPK registration/activation/processing/convenience at any point of time as its sole discretion with prior intimation to the customer. User: means the User and /Or Customer who is named in the Online Registration Form or in the offline Form Application overleaf. Company: means Itsilver Innovation and Infotainment Llp. SRPK: Sarkari Rozgar Protsahan Kendra, Government Employment Promotion Centre, An Itsilver Innovation and Infotainment Llp Initiative. Service: means SRPK online service help the user to apply for the govt. jobs. Website: SRPK official website i.e. www.srpk.in , where the user can access all the SRPK services. a. Services will be available to the customer only in India through SRPK website but anybody can able to access the website worldwide, subject to the factors like acts of God, fires, strikes and embargoes, war, insurrection, riots and other causes beyond the control of the company including atmospheric/ topographical hindrances. In no event will the company be liable for direct or indirect, consequential or economic loss or damage, including loss of profits and loss of reputation / defamation, even if advised of the possibility thereof. b. The company may suspend whole or part of the services at any time without prior notice. If the server fails or requires modification or for reasons beyond the control of the company, the user will remain liable for the service charges during that period of suspension. c.	The SRPK Card is and will always remain the exclusive property of the company and be subject to the change at any point of time. If the card is lost, stolen, misplaced or damaged, the user will be responsible for payment of service charges & bills, till the card is deactivated. The company will replace the Card only on written intimation as soon as is reasonably practicable but reserve the right to charge in doing so. a. The subscriber shall make the following payments. i. One time payment of registration or Application Fee to register for the SRPK service and to get the SRPK card. ii. Activation fees to activate the SRPK card for certain period of time to enable access to SRPK services. iii. Service fees as described by the government employer to apply a particular job during the time when user is going to apply the job. iv. Convenience fees to apply a particular job each time. v.	Late fees, if applicable when applying a particular job after its due date. vi. The company has introduced other fees and may introduce more fees plans. The company reserves the right to withdraw any such fees and/ or to revise the fees and charges applicable to such service, with prior notice to the user. vii. SRPK Renewal fees will be applicable if user wants to continue the SRPK card service in the future after its expiry. b. The company is accepting the fees through Credit Card, Debit Card, Cheque, Demand Draft, POS, VPP and not accepting the cash payment, user will be responsible if he/she gives any payment in cash anywhere. User can only deposit cash payment to India Post. c.	The payment for Account Activation will not be refundable under any circumstances. No refund will be initiated in favor of user in any case. d.	The payment is non transferable and cannot be used for another person. e.	All the payment is inclusive of all the taxes. a. Once User has activated his/her account it cannot be deactivated before its expiry. b. The company may, at its sole discretion, terminate the service if the user commits any breach of the terms & conditions contained herein. a. The terms and conditions contained herein shall be governed by the Laws of India and shall be subject to the exclusive Jalandhar jurisdiction. a. Both the company and the customer shall keep in confidence any information received by either of them irrespective of the business or the matters concerning the other and shall not disclose the same to any third party, except to any concerned authorities, provided however, the company shall be entitled to disclose the details of the customer's personal details, name, address, documents (including personal identification proof, residential identification proof, pan card, academic certificates, skill certificate, experience certificate etc.) contact information and other information to any Government Employer or any Public Sector to which he/she is applying for the govt. job. a. User must provide proof of his identity (passport or national identity card) at registration. This identity document must contain a number, a signature, a date of birth and a photograph. User can ask the SRPK representative who will tell you which type of identity document they accept. b. User must provide two recent identical passport-sized photographs on registration (for Offline Application Form). c.	If at any stage, it is found that user has provided any wrong information for SRPK registration. The registration will be cancelled automatically. d.	The personal data of user in application is collected for the purpose of SRPK online registration and to be used for applying the Government Jobs in the future. This data is to be disclosed, processed and stored by the company for the purpose of such administration. e.	Your personal data may be processed in an anonymous form by the company for statistical and research purpose for the SRPK Registration. And it is confirmed that it will not disclose personal information about candidates to others except as stated in Confidentiality (7.a.). f.	User may view a copy of his personal data Contained in the application form by contacting the representative and can take the duplicate copy of the filled form. User can also view his whole personal data contained in the application form through SRPK online panel. g.	If the user has paid only for the SRPK registration his account will not be activated until user pay for the activation fees. h.	If the details on this form are not completed the application may not be processed. Completing and submitting this application form does not guarantee the registration for the government jobs. This registration is only applicable to be registered with the SRPK website. i. Any personal data collected during registration process by the SRPK team either at offline registration or online registration at SRPK website will be processed and securely stored by the company for the purpose to apply the Govt. Jobs. j. Your personal data including emails, phone number, and addresses will be used by SRPK to send the newsletters, activities alerts on SMS or sending any kind of document to your address respectively. k.	The photograph attached with Offline Application Form or uploaded online will be provided to any recognized government organization or authorities during job application process to which user apply for the purpose of govt. job. l.	Company only accepts the fees thorough Credit card, Debit Card, Cheque, Demand Draft, POS, VPP and will not be responsible if user pay any fees in cash mode to any representative. m.	The document copies (including personal identification proof, residential identification proof, pan card, academic certificates, skill certificate, experience certificate) taken from user will be provided to any government employer organization to which user apply for the purpose of govt. job during the process of job application. n.	User signature taken on Offline Application Form or uploaded Online will be used in the job application process and will be provided to any government employer organization to which user apply for the purpose of govt. job. o. There are online terms and conditions user must comply with and that the company will provide details of these on SRPK website. p.	User must complete the online application on SRPK website to be eligible for applying the govt. job thorough SRPK website. q.	SRPK card will be delivered to user within the time period as mentioned in the SRPK shipping policy. SRPK card may not be issued to user within set time period if SRPK deems it necessary to review any matter associated with user Information and details, including personal information, address details or making enquiries as to whether any rules or regulations have been breached. User may be required to provide additional information for the purpose of assisting any investigation before or after activation. In exceptional circumstances user may be required to provide any information to SRPK. r.	Company will be not responsible for any delay or alteration which occurs at the government employer organization. s.	Company reserves its right to modify, alter and / or include any other Terms and Conditions that may be deemed necessary in the interest of the user. t.	SRPK is only the medium to apply the government jobs, and will not be responsible while appearing in government job tests or interviews. User will be fully responsible for the results of tests or interviews and SRPK will not take part in that process. Company will not be responsible if user never gets the government job. u. If user suspected of engaging in any form of malpractice, or do anything that might damage the integrity and security of company or interrupt the laws of Government of India, user may not receive the SRPK activation card, user registration or activation fee will not be refunded and user may be prohibited to apply SRPK activation or any job in the future. Despite and without limiting any of the terms of this declaration, user understand that details of malpractice(including evidence of suspected malpractice) that has been established, is suspected or is being formally investigated may be provided to recognized organization or disclosed in accordance with the law. User further understand that suspected malpractice will be reported to recognized authority against which the malpractice has been occurred. a. By filling any Online/Offline Registration/Enquiry form, you agree that SRPK and ITSILVER Innovation and Infotainment Llp may use your name, email address, phone number or other data to communicate with you through calls, SMS and emails, either by itself or through any of its designates. b. SRPK from here after can contact you anytime in future. c. You may receive newsletters, e – brochures, emailers, SMS from SRPK anytime. d. User can request to stop SMS or Email alerts by sending mail to support@srpk.in any time if you wish to. Itsilver and SRPK assures you that it will not sell this information to any third party. e. SRPK and Itsilver Innovation & Infotainment Llp hold the complete authority to change any term and condition without any prior notice. f. SRPK is not responsible in case of Job expiry due to inconvenience by User End OR Employer End - Due to the non availability of documents; User not receive the confirmation call; Due to website problem or Server issues; Link not updated on Employer website. a. These Terms & Conditions are subject to change. b. 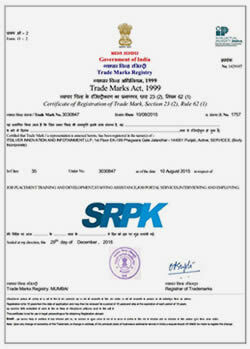 Please visit our website www.srpk.in for the updated Terms & condition. 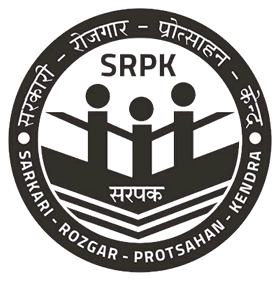 Disclaimer: The Sarkari Rozgar Protshan Kendra is designed to be used by a candidate to apply a government job through SRPK website without interacting directly with the Government Employers. SRPK is not designed to be the sole method of conducting tests or interviews or to provide the government jobs. SRPK is made available all over India to all persons, regardless of age, gender, race or religion, but it is not recommended to the candidates under the age set by authority of Government of India.